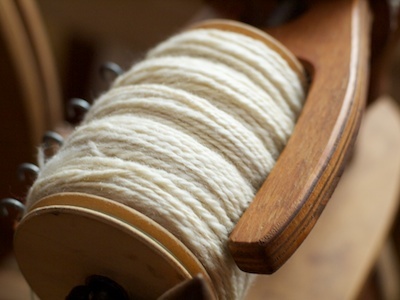 Today’s a quiet day here, and in between work and writing I sat down and plied up the BFL I’ve been spinning for ages. When I’d started this, I’d taken the two big bumps of roving, and using my handy dandy scale, divided it into three equal piles. 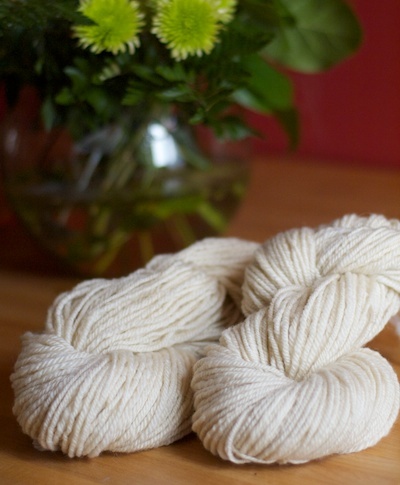 Each of those was spun up into singles, with the hopes of ending up with a beautifully bouncy 3-ply. It remains to be seen if it’s beautifully bouncy, but it is a three ply, and if my measurements are okay, it should be about 270 metres – which is enough for… well. I don’t know what it’s enough for. I actually have no idea at all what I might use it for. Those times seem to be a little rare though, and mostly I find myself spinning the way I knit… for the experience of the thing. 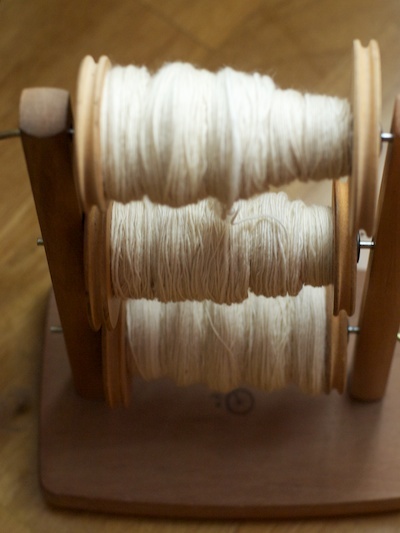 I don’t always even want the yarn that I make – I’ve given away pounds of handspun over the years, and the knitters I give it to always seem shocked that I’d let something so dear go – but the truth is that by the time it’s spun, it’s done its thing. The fibre’s gone from one state to another, from fleece to yarn, or roving to yarn, and I’ve sucked all the satisfaction out of it that I need to. Sure, if I knit with my own handspun there’s another layer of satisfaction – there’s almost nothing that feels as good as starting with a sheep and ending with a hat, having only your own two hands to thank for it – but for me that must be like some kind of bonus round, since I regularly buy and spin fibre that can’t possibly become yarn I like. This yarn, I really do love. It’s plain and traditional and those two skeins are totally something I would use, and as I took them off the heater where they were drying, I realized I have no plan for them. None. Zip. I don’t think I’ll give them away – but I realized that as I lifted them up and hugged them (they are pretty bouncy) that what I was thinking was "Good. Finished" instead of what I always thought I would think – which is "Good, next step?" This yarn doesn’t seem to want to be anything, except for yarn, and I need inspiration. You know the way there’s product knitters (knitters who knit to get the stuff) and process knitters (knitters who knit because they like knitting)? I think I might be a process spinner, and now I need help figuring out what the product part should be. 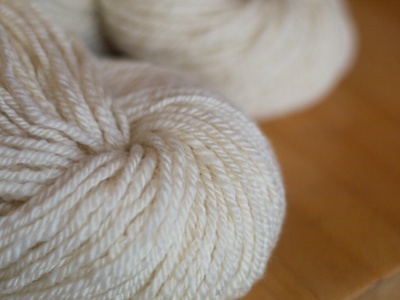 It’s about 270m of what looks to be a light worsted. Can you tell what it wants to be?